Jaipur is one of the most important destinations on world-renowned golden triangle tour of India, Jaipur appears as any North Indian city unless you know its specialties. It is known as the pink city of India, this capital of Rajasthan state which attracts all and sundry. There are several factors that attracts tourist to its land. One should be aware of the fact that the state Rajasthan is the region which shares the moment of pride and honor because of its enriched heritage and culture all over the world. Jaipur, which has the title of the capital of Rajasthan, is one place where the fusions of traditions along with modernization are seen. For centuries, the Pink city of Jaipur has been a great hub of arts and craft. The tourists can get an opportunity to buy arts and crafts at the Johari Bazaar, this market is well known for arts and crafts. Handicrafts items are also a good thing which one can buy from Jaipur for souvenirs. The colorful old city which is painted Pink is the reason of the alternate of Jaipur i.e. Pink City. The pink color makes the city look more beautiful and more people are attracted towards it. Let the people attract to the perfect combination of the city with color because of which the city is also known as the city mixed with the perfection of geometry and colors. Since ages, art and craft is an integral part of Indian ethos. These arts are coming from the ancient time. The art and craft of Jaipur is well known within and outside the country. The amazing paintings portray the luxurious zeal that the city’s culture embraces. The colorful and pleasing costumes and jewelry of Jaipur are constantly in demand throughout the year. The vivid and enchanting puppets of Jaipur are known round the globe. Still, there are few gems of Jaipur which put it up bright on the world horizon. The Jaipur Foot, Palace on Wheels, and the renowned Raj Mandir Cinema Hall are few of the well known solitaires of the city. Jaipur Foot as the prosthetic foot from Jaipur is renowned for its low-cost and reliability. The local Kathputli form, using small wooden dolls on strings, has been around for a thousand years, conveying moral messages and exploring social issues. The craft work of Jaipur is known around the globe for its fine and superior work. Jaipur is known as the leading manufacturer and exporter of carfts. To add beauty to the crafts, several forms of art are done on them. The Pink City is a hub for various products. These products are known for their patterns, prints, colors and designs. Blue pottery is a traditional craft of Jaipur and is widely recognized. Its origin is from Turko –Persian. 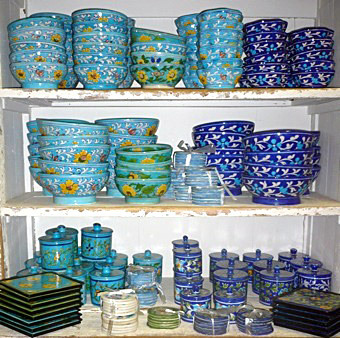 The blue color which is used to die the pottery is eye catching and name blue pottery comes from the dye blue color only. Some of the potteries are semi-transparent and are beautifully decorated animals and birds are made on it. These potteries are very fragile as it is being fired at very low temperature. All types of moortis, human statues, artistic statues and temples are also built by Moorti India manufactures. All the temples and murtis are sculptured and completed in Jaipur and nearby areas in other cities of Rajasthan. Moorti India is the leading producer and exporter of marble statues of all Indian Gods and Goddess. Moortis of Jain, Hindus, Sikh, Vaisnav, Jesus sculpture, handicrafts and garden statues, religious places are made by Moorti India. Pillars are carved out of marble stone which are highly durable and resistant to seasons. Intricate and beautiful designs are carved out on these pillars. Marbles can also be used for table stands, as this is a hard and durable stone. Because of its fine and superior surface finish it is used in decorations also.